Aniko Zala started on her path to being an herbalist after a years-long bout of chronic stomach pain. As she explains, “I was at the mercy of impersonal doctors and fruitless tests for a long time before someone suggested trying a peppermint tincture.” Just a few drops unexpectedly brought powerful relief for Zala. After that she couldn’t stop studying how to use plants for health and balance. In 2015, she started more formal learning under local herbalist and ethnobotanist Dawn Combs. And in 2016, she launched Wild Origins. 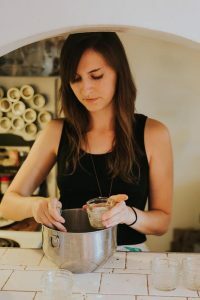 Zala describes herself as an herbalist, teacher, and maker with an interest in the intersection between nature, self empowerment, and self care. Wild Origins is how she can help others find the power that herbs have to bring our bodies and minds into balance. Through Wild Origins Zala teaches hands-on herbal workshops around Columbus and sells handmade herbal body care products. Her herbal body care products are focused on use for health, beauty, and ritual. Her most popular products are ones that require you to slow down for some ritual self care, like the herbal body cream, the salt scrub, the face wash, the dream balm, and the rose+mugwort body oil. If you’re looking for ways to add self care and herbal treatments (especially as part of your New Year Resolutions or Intentions), Zala has some advice. She suggests starting with at least one plant or nature based self care ritual. Zala is also looking forward to the new year too, explaining how she’s really excited that next month (February) she’ll be going deep into what has been her most popular hour long workshop: Herbs for Stress, Anxiety, and Sleep. This time, she’s turned the workshop into a month long online course starting February 6th and running through March 2nd. The last event Zala will be doing for a while is selling at the Winter Flea on February 5th. She’s expecting her first baby in March, “so I’m allowing myself to wind down my schedule for the next few months (other than the online course! ),” she explains. But Zala will be back soon. As she’s already thinking about easing back into it again in May with a new workshop on herbs to regulate menstruation and ease menstrual pain. She also foresees a workshop on herbal pregnancy and infant care in the future. 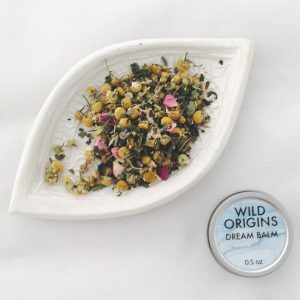 You can keep up-to-date with all of Wild Origins and Aniko Zala’s workshops + products by visiting them online at www.mywildorigins.com and following along on Instagram at @wildorigins.